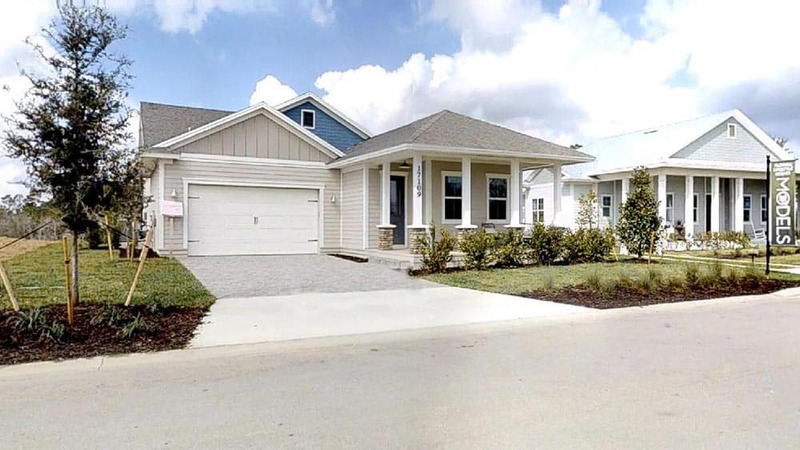 Florida Lifestyle Homes has completed and opened its newest model, the Sydney, at Babcock Ranch, a new eco-centric town being developed in Charlotte County east of Fort Myers off State Road 31. A front porch welcomes visitors to the home and invites residents to spend time visiting with neighbors, enjoying the features of this unique community. A great room design, the Sydney includes two bedrooms plus a den and two full baths. The flexible design allows the den to be used as a third bedroom for guests. Guests enter the Sydney through a traditional foyer. A tray ceiling defines the living space of the great room and dining area. The kitchen includes a large island and work space with state-of-the-art appliances and a walk-in pantry. The island functions for dining and entertaining. The gathering area is bright and cheerful, combining living, dining and kitchen to accentuate the livability of the home. Weathered wood plank tile, painted white cabinetry and combining with warm wood tones and bright fabrics provide an Old Florida effect. The master suite is at the back of the home for privacy and has its own entry to the lanai. The master bath includes two vanities, a walk-in shower and a private water closet. There is a large walk-in closet. Sliding barn doors provide an impressive entry to the study. Just off the foyer, the guest bath has a shower plus a linen closet. A covered lanai stretches across the back of the home and provides views of the preserve. A complete outdoor kitchen makes outdoor entertaining easy and convenient. The Sydney encompasses 2,324 square feet of air-conditioned living space. With the front porch, a large covered lanai and a two-car garage, the home has a total of 3,507 square feet under roof. The Sydney is priced at $699,500, including furnishings by Norris Home Furniture & Interiors with a model leaseback available Florida Lifestyle Homes offers homes in Babcock Ranch ranging from 2,324 to 4,081 square feet. Well versed in custom construction with an in-house designer, Florida Lifestyle Homes can modify or create a home that fits the buyer’s lifestyle with square footage starting at 2,000 square feet. Honoring the traditions of Southwest Florida architecture in the early 20th century, the Old Florida and Farmhouse architectural-style homes at Babcock Ranch are built to Florida’s Green Building Coalition standards and are on preserve and lakefront home sites. Babcock Ranch encompasses 17,608 acres and is the first solar powered town worldwide. Florida Lifestyle Homes Inc. is a preferred builder in Southwest Florida’s premier luxury communities, including Quail West, Naples Reserve and Treviso Bay in Naples, West Bay Beach & Golf Club in Estero, and Cape Harbour in Cape Coral and Babcock Ranch in Charlotte County. The company also has large estate home sites available in the private boating riverfront community of Caloosa Preserve and builds custom homes on owners’ lots throughout Southwest Florida.